Another factory fire kills eight people, as death toll after Rana Plaza collapse reaches 900 and negotiations between IndustriALL and international clothing brands intensify before the 15 May deadline for a binding fire and building safety plan for Bangladesh. May 9, 2013: Yet another garment factory fire occurred at 11pm on 8 May, killing at least eight people in the Mirpur industrial district of Dhaka. The fire at the 11-storey building owned by the garment exporting Tung Hai Group could have been disastrous had it occurred during the day when hundreds of workers toil in the building. The eight people killed were the building executives holding a meeting and a police officer and drivers. Although the fire broke out on the third floor and the meeting was held on the top floor, the eight killed were trapped. Tung Hai had other factory fires in 2009 and 2010 and produces for well-known retailers. On 8 May the Bangladeshi authorities announced the closure of 18 garment factories for failing to comply with safety regulations. The latest fatal fire added a dramatic sense of urgency to IndustriALL’s negotiations with international clothing brands and retailers that source from Bangladesh. The parties have agreed on a 15 May deadline to seal a binding Accord on Fire and Building Safety in Bangladesh. The Accord foresees a coordinated system of inspections, training and financial commitments necessary to build a sustainable garment industry, and empowering workers to refuse dangerous work. IndustriALL has welcomed the joint statement issued on the occasion of a 1-4 May high-level mission of the International Labour Organization (ILO) to Dhaka. It includes commitments on an ILO-compliant labour law reform by June focusing on freedom of association and collective bargaining, guarantees hundreds of new inspectors and extensive training programs. The responsibility of the retail corporations is most clearly illustrated by the tiny percentage of their profits that go to labour costs and safety costs. An average of US 2 cents of profit on a t-shirt would double the salary of the Bangladeshi that made it. An average of US 10 cents of profit on each garment would pay for a transformation of safety standards across the entire industry in Bangladesh. The IndustriALL Bangladesh Council’s unified demand on wages is for an immediate increase from 3000 taka per month to 5000, to be followed by incremental increases each year to arrive at a living wage in the year 2015, in a process similar to that seen in Vietnam currently. Hundreds of thousands of supporters, activists and trade unionists have joined a number of online petitions calling for change in Bangladesh towards creating a more sustainable garment industry. The death toll has reached 900 in Savar as bodies are still being pulled out of the rubble. IndustriALL affiliates are contributing to the humanitarian relief effort, including CA$15,000 from the USW of Canada. IndustriALL Global Union continues to give support to the free, independent and democratic trade union movement in Egypt through a special education and training program supported by AFL-CIO’s Solidarity Center via the International Trade Union Confederation (ITUC). May 9, 2013: A first ever two-day planning and assesment seminar was held at the end of April in Cairo with participation of around fifty participants from different sectors within the jurisdiction of IndustriALL. The seminar welcomed leaders of the Egyptian Federation of Independent Trade Unions (EFITU), Kamal Abu Aita, and Egyptian Democratic Labor Confederation (EDLC), Yousri Marouf at opening sessions. Abu Aita and Marouf underlined the importance of global union solidarity in the process of establishing a free and democratic union movement in Egypt. IndustriALL’s Assistant General Secretary Kemal Özkan and Member of Executive/Finance Committees Tahar Berberi were also among the attendees explaining policies and practices of the global union at global and regional levels. This led a discussion about major challenges faced by independent unions in the country. State intervention and barriers over collection of union dues, among others, were defined as prominent difficulties in flourishing of the new unions. International labour norms and standards were widely discussed by the participants following the presentation of IndustriALL and representative of ILO’s ACTRAV, Mohamed Trabelsi. Trade union rights and liberties were debated within the context of development of labor legislation in Egypt through a presentation by Dr. Rafaat Dessouki from Ainshams University. The delegates took up union organizing and campaigning using international instruments with an overview on OECD Guidelines and Global Framework Agreements. A number of ongoing labour conflicts and problems were raised by the participants, and follow-up stages through global union solidarity were discussed. IndustriALL’s delegation also visited ongoing pickets organized for Bahayra Company for Land Reclamation and Schlumberger Oilfield Services in the city of Al-Qatemaya. The delegates worked in groups on the creation of a culture of working together in building national union power and proper structures. IndustriALL’s program will continue with other events in various cities such as Alexandria and Mahalla in the months to come. 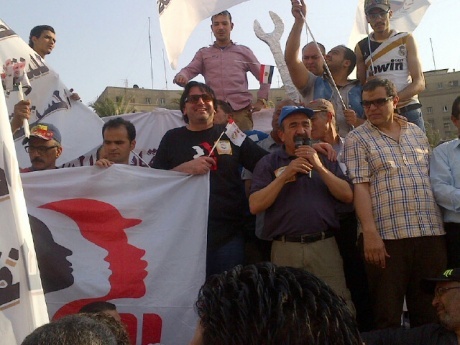 IndustriALL Global Union was also part of the May Day March and Demonstration at Tahrir Square in Cairo. Independent trade unions, political parties and civic society organizations combined their forces to voice demands of the Egyptian society under a slogan of “We want to work, we want decent wages and we want free unions”. According to a recent study, labour strikes and social protests have more than doubled since the last presidential elections and are likely to continue doing so. “IndustriALL Global Union is proud to be present shoulder-to-shoulder with Egyptian workers and society in supporting their demands for real democracy, and genuine human and trade union rights,” said Kemal Özkan, Assistant General Secretary. “Egypt will continue as one of our priority countries, and our special program will extensively continue”. IndustriALL Global Union’s Turkish affiliate Deri-Is has struggled for union recognition at ISMACO producing for luxury Italian brand Ermenegildo Zegna since late 2012. But the company’s local management, despite all constructive efforts, persistently continues to violate fundamental worker rights. May 9, 2013: In addition to four already dismissed workers, ISMACO dismissed five more members of Deri-Is, namely Turan Ba? (5,5 years seniority), ?mam Hüseyin Gümü?soy (2,5 years seniority), Bilal Gümü?soy (6,5 years seniority), Celal Ayd?n (13 years seniority) and Mustafa Ta? (9 years seniority). The company’s lawyer announced the reason of dismissal as these workers distributed union leaflets without permission of the local management. The five union members did indeed handbill union brochures inviting workers to join the union. Workers were first urged and asked to give their testimonies because of this big offence! Then they were dismissed. Actually two out five, Turan Ba? and Bilal Gümü?soy, had already been elected as employee representatives and their sacking was a tactic employed by the company to break union organizing at the workplace. IndustriALL Global Union in the meantime continues to support Deri-Is’ campaign. 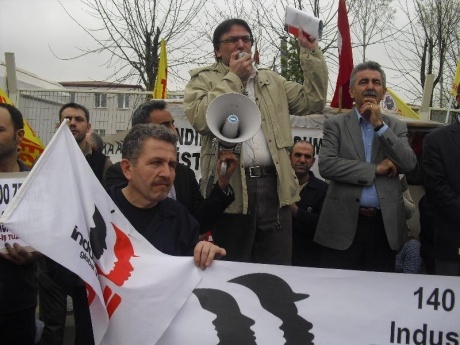 In early April, on the occasion of the IndustriALL/UNI/ITF Joint Forum on Organizing at the end of March, an international delegation joined the dismissed workers in front of one of the shops of Ermenegildo Zegna in the luxury area of Istanbul, called Ni?anta? ?, urging the company to stop anti-union practices against union members and unionization. Along with this, IndustriALL’s Assistant General Secretary Kemal Özkan visited the picket line and the tent of the dismissed workers at the entrance of the free zone in Tuzla district, and gave the same messages to the company receiving large media attention. IndustriALL Global Union also communicated with its Italian affiliates in textile, garment and leather sectors to take initiative with the central management of Ermenegildo Zegna with a view to finding a solution for the ongoing situation. The company raised the similar arguments as did its local management in Turkey which was overwhelmingly on the basis of Turkish labour legislation that clearly breaches international conventions of the ILO. However IndustriALL’s close NGO ally Clean Clothes Campaign, together with the local community, mobilized its chains in different countries in a supportive campaign for the demands of Deri-Is. “These last five dismissals clearly demonstrate the intention of the company,” said Kemal Özkan, Assistant General Secretary of IndustriALL Global Union. “We have made all our attempts to solve this problem with a dialogue, but it does not work. Ermenegildo Zegna leaves us one option, and we will do that”. Honda Mexico has breached a workplace agreement and dismissed five workers in a complicit campaign by the company and local protection union, SETEAMI, to intimidate the workforce. May 9, 2013: Honda dismissed the five workers on 7 May. All of them were members of the committee that negotiated a settlement after 90 per cent of the workers showed their dissatisfaction with the company’s refusal to share its profits in a work-stoppage on 16-18 April. A quick return to work. No pay deductions for absence from work on 16, 17 and 18 April 2013. No reprisals against striking workers who comply with this agreement. Maintain relations between the company and workers. Both sides agree not to divulge the agreement’s terms to third parties. The Honda Mexico workers’ union (STUHM) said: “It is clear that the company has acted dishonestly by dismissing workers who were directly involved in the demonstrations. It has done this in order to discourage workers from seeking union representation that defends their interests and to intimidate all Honda workers who are trying to organize to improve working conditions”. The STUHM called on the federal and local authorities that participated in drawing up the agreement to intervene and insist that the company comply with its commitment to not dismiss workers in reprisal for action taken in response to the company’s refusal to make a fair profit-sharing payment to workers in accordance with the profits it made in 2012. At a press conference on 8 May, STUHM representatives described what was happening at the company, including the dismissal of the five workers who remain determined not to accept the unjust termination of their employment contracts, and instead declared themselves ready to return to work. IndustriALL believes it is clear that Honda wants to punish the workers who demonstrated in support of their legitimate rights and, in this way, discourage workers from organizing to obtain decent working conditions and genuine trade union representation. IndustriALL has written to express its solidarity with Honda workers and to demand that the company complies fully with the agreement signed after tripartite negotiations. The letter sets out IndustriALL’s support for the union’s demands, calls for the company to comply with its commitment to not take reprisals against workers who participated in the strike and urges Honda to immediately reinstate the five dismissed workers. IndustriALL Global Union’s global framework agreement (GFA) with the Spanish-based world’s largest garment retailer Inditex has entered into a new phase of implementation in Turkey through a pilot project bringing together worker and management representatives from supplier factories with training sessions. May 9, 2013: Inditex and IndustriALL have developed a Guideline on Free Elections of Workers’ Representatives, and concept paper for a prototypic program covering workers and managers from supplier companies with a view to proper implementation of provisions of the GFA and the protocol on involvement of local unions. A pilot project in Turkey has started with a workshop in Istanbul on 25 April with participation of around fifty worker and management representatives from four factories supplying to Inditex as well as leaders from IndustriALL and its two Turkish affiliates DISK/Tekstil and Deri-Is. Workers representatives were already elected at the factories concerned through town-hall meetings where the global framework agreement was explained with a particular emphasis on fundamental rights and freedoms. Following a start with a joint session where the purpose of the project was identified to all the participants, two separate sessions, one with elected employee representatives and another with managers, were organized. Finally the separate groups reconvened in a joint session to share the findings and to frame future work under the GFA. In the two parallel sessions, Turkish individual and collective labour legislation, ILO Conventions and major axes of the Framework Agreement were specifically discussed through speakers from universities, trade unions and employers’ organizations. A lively debate in the workers’ session focused on particular circumstances with a view to finding ways to handle problems through dialogue, union organizing and collective bargaining. Most of the participants cited that it was their first time having such open discussion about their working and living conditions with a hope for further improvement. Discussions in the session of managers focused on the country’s business culture, approaches over corporate social responsibility and working with trade unions in a spirit of dialogue. At the end, the seminar with representatives of workers and management from supplying factories constituted a breakthrough in forming a solid background for social dialogue within the spirit of the GFA. As a first experience with its pilot character, the seminar identified findings to prepare a basic document that will essentially work on further implementation of the GFA, and serve as preparation of future applications of this method of working. The project in Turkey will continue at other Inditex supplier factories with the involvement of other IndustriALL affiliates in the sector, Teksif and Öz ?plik-? ?.